To see the Final 4 results click here and scroll to the bottom for how to play your own games for free. The Eastern Bracket played out while improvements were still being made to the game. The ACC beat the Ivy League and the Big East beat the A10 in the semifinals as the better seed won in all seven games including the ACC winning the Region. The sheet below was the sheet being used which only covered one half of the game. The game took about 90 minutes to play during these beta tests, before improvements and the new sheets for the entire game sped it up to the current 30 to 35 minute game. 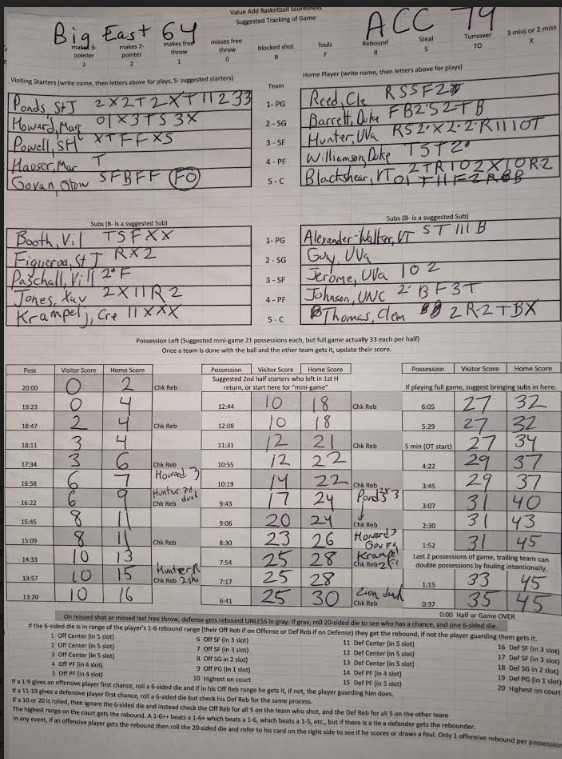 The player cards and basics of the game were not changed though, except that the margins in old games tightened as improvements were made - in this case yielding a 79-64 ACC East Region Championship over the Big East if the same number of rolls and tweaks were used when that game was played. The ACC advances to the Final Four in the one bracket that was complete "chalk," no upsets. The entire bracket of all-conference teams is tracked here.